Overview: The story of the Ishmael-like friendship between two young men: a wealthy white New Yorker, Michael Cooke Holt, and a black tent-fundamentalist preacher, Elijah Broom, set in that period of turmoil and crisis in American history in which scientific marvels, social unrest, economic disasters, and the First World War, created new vistas about the individual and the nation. 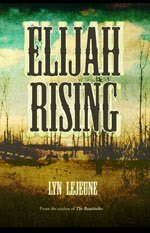 In Lyn LeJeune's Elijah Rising, the heir to a railroad fortune, Michael is an aimless soul struggling to find his path in life. In World War I America, patriotism prevails and pacifists are punished. A misfit in the academic world and rejected for military service, Michael lives off a generous allowance from his callous mother and passes time in between bouts of drinking by wandering the streets of New York City. There he meets the disadvantaged and downtrodden and feels the need to share about their suffering through his writing. I relish a story where I reach the last page with a better understanding of the times in which it took place. Elijah Rising, in which the narrative alternates between Michael and Elijah, is one such book. I learned far more about the social and political workings of earlier 20th century America than I ever did from a textbook. This is by no means a light read; it is as times dark and disturbing to know of the prejudices that persisted long after Emancipation and that hate crimes existed long before they had a name. The author does not avoid close inspections of squalor, disease and crime. Michael is a humanitarian ahead of his time and through his eyes we view the complex and often ugly society that existed just a century ago in America. Available from inGroup Press and at Amazon.com.